UFOs have been spotted across the globe. Dr. Russell Marvin (Hugh Marlowe) and his wife Carol (Joan Taylor) are on their way to the secret headquarters of Operation Skyhook when they’re strafed by a saucer! They tell Carol’s dad, General Hanley (Morris Ankrum) what occurred. The General in turn reports all the satellities they’ve sent up have been destroyed by mysterious forces. When Marvin and his crew send up the next one, the base is attacked by saucers, and the rocket launch incapacitated. Soon General Hanley is captured by the aliens, and Marvin learns to communicate with them. The alien’s intent: destroy Planet Earth! Our weapons are useless against their superior technology! 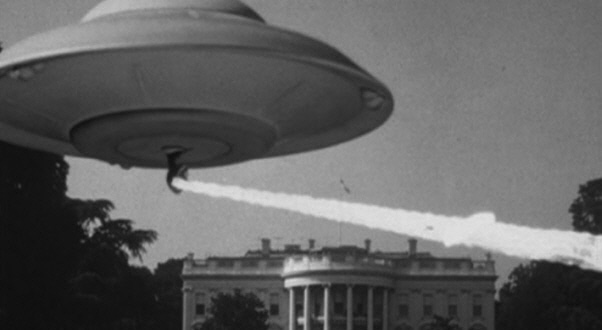 CAN EARTH BE SAVED FROM THE FLYING SAUCER INVASION?!?! If you’re a fan of 50s sci-fi, you already know the answer. And if you’re a fan of Sam Katzman movies, you know it’ll be chock full of stock footage and made on a miniscule budget. The saving grace of EARTH VS THE FLYING SAUCERS is the special effects wizardry of Ray Harryhausen. Ray gives us alien spacecrafts instead of the usual giant monsters in this one, and they look fantastic. 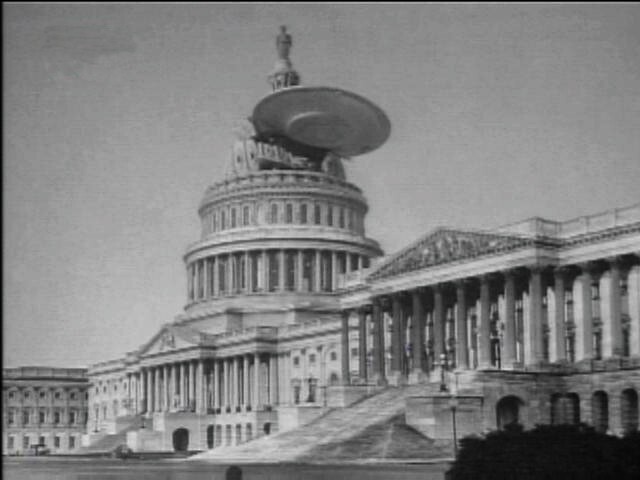 It’s fun to see Harryhausen’s saucers blowing up famous Washington landmarks (including the Capital building…beware, Congress!). Director Fred F. Sears keeps the movie moving along at a brisk clip, so you almost don’t notice the budgetary limitations. Well, almost. The cast perform their parts fine. Movies like EARTH VS THE FLYING SAUCERS aren’t about the acting anyway, it’s all about the space aliens and their weapons of mass destruction. There are two cast members I’d like to single out, though. These guys don’t appear in the film, but you’ll recognize their voices. William Woodson narrates the movie, and if the name doesn’t ring a bell, the voice certainly will. He made a career out of narrating films and TV shows, most notably the 60s series THE INVADERS and the first season of THE ODD COUPLE. The other gentleman portraying the disembodied voice of the alien is Paul Frees. 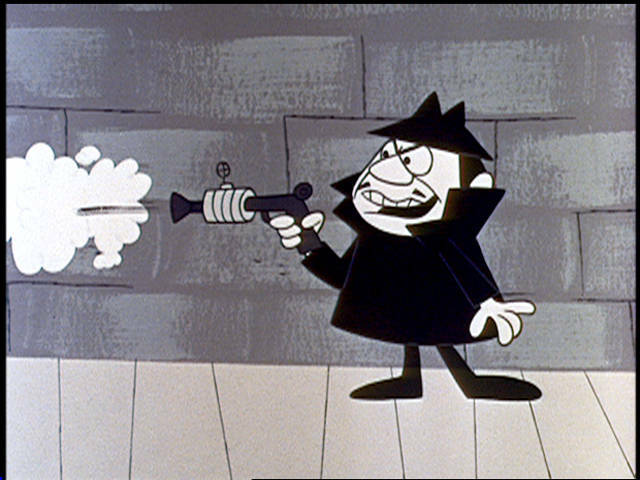 If I took the time to cite even half his credits we’d be here all day, so I’ll just tell you he’s most famous as the voice of Boris Badenov, arch-enemy of Rocky the Flying Squirrel and his pal, Bullwinkle J. Moose! If you want more info, all you’ve got to do is Google. 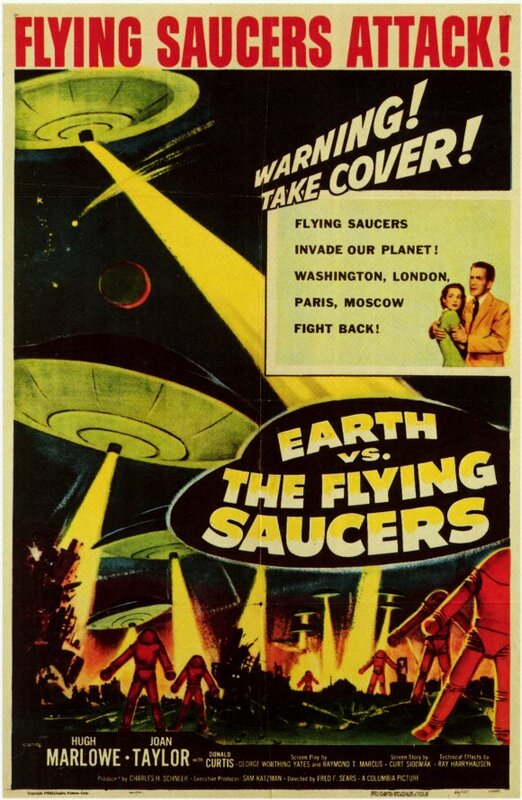 EARTH VS THE FLYING SAUCERS is the type of movie where you can just shut your brain off and enjoy. You’ve seen it all before, and you know the good ol’ USA will emerge triumphant. The fun is in getting there, and you’ll enjoy the trip watching EARTH VS THE FLYING SAUCERS. So pop some corn, put your feet up, and get ready to be entertained! Or maybe your passion is like Gary’s at Cracked Rear Viewer: a love for classic films!